After all the speculations and leaks, finally, OnePlus has launched its 2018 flagship, OnePlus 6. Undoubtedly phone is one of the best in class and there are many reasons which proves the same. Today in this article we are going to talk about 3 things that make OnePlus 6 best buy. Powered by 2.7GHz Octa-core Qualcomm Snapdragon 845 processor paired with 6/8GB of RAM, the SoC built using four Kryo 385 Gold cores helps the phone achieve for 10-20 percent bump in performance and up to 30 percent boost in efficiency over the OnePlus 5T. The SoC also houses the Adreno 630 GPU, which again provides an almost 30 percent jump in performance during graphics-intensive tasks. But it is the upgrade in optics that truly makes the OnePlus 6 worthy of being called a flagship. The picture taking prowess of OnePlus devices has always been used as a stick to beat it with when compared to the Galaxy, Pixel, and iPhones. With the OnePlus 6 that could change. Though, we don't expect it to beat the best in business hands down, but the inclusion of OIS to both – 16 Megapixel+20 Megapixel — sensors in the dual camera setup at the back, as well as the image sensors being enlarged 19 percent from the ones used in the 5T should see the OnePlus 6 shoot better low light photos with less noise. 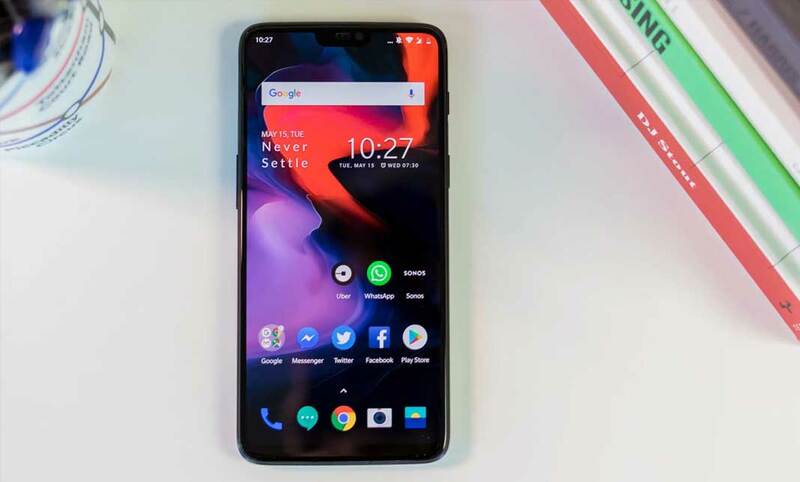 With the 5T, however, OnePlus tried to change the perception by slapping on its new phone an edge-to-edge display that greatly improved the device's looks. With the OnePlus 6, it has gone one step ahead by further ramping up the design. For what it's worth, the device comes with a 6.28-inch FHD+ AMOLED panel — offering 90 percent screen-to-body-ratio making it the biggest screen on a OnePlus phone yet, but without increasing the phone's footprint. But the biggest change of them all is that unlike the metal unibody frames of the previous phones, the OnePlus 6 sports an all-glass design, affording it the looks and curves of an ultra-premium device such as the iPhone X. The phone is available in three colors, Mirror Black Midnight Black and Silk White. Though all three look absolutely premium, it's the latter two which elevate the phone to the truly premium bracket. The Midnight Black with a sheet of textured glass gives the phone a ceramic look, while the special Silk White variant with crushed pearls and an aluminum frame is a device that anyone would want to covet. Basically, if you are Ok with 6 GB RAM and 64 GB storage which is good enough for the mobile device in most of the cases, Rs 34,999 is not the bad deal. As the launch promotion, SBI cards holder will get additional Rs 2,000 discount which makes the device price more competitive.